We like to call Renaissance City Choir a “community that sings.” As part of our community, you can learn, grow, and challenge yourself while making beautiful music, lasting memories, and lifelong friends. 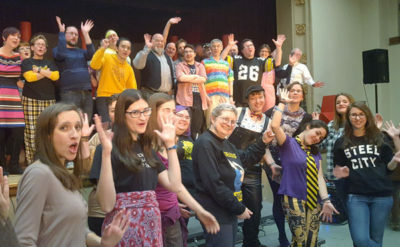 Both parts of the choir rehearse once a week (Tenors and Basses on Monday nights; Sopranos and Altos on Tuesday nights) from 7:00 to 9:00pm at East Liberty Presbyterian Church. The choir produces three major concerts per year—Holiday (December), Cabaret (March), and Pride (June). As performances approach, there may be additional rehearsals. You can expect to spend some extra time at home (and in the car, listening to recordings!) learning your music. Since we normally only rehearse once a week, extra time in between rehearsals is essential to learning the music and presenting a quality performance. There are also additional, optional performances that are scheduled each season within the community and at charity events. We encourage members to participate in as many of these as their schedules will allow. They are a very important part of our choir mission. Dues are paid each season within the first few weeks of rehearsal: $120 for the year or $60 each semester. Members may apply for a payment plan, as well as partial or full scholarships. Other costs: Members may wear either tuxedos or gowns for the Holiday concert. There may be other small costuming costs for each concert. The choir also holds several fundraisers during the year that you may choose to support financially. Each potential member of the RCC has a 10-15 minute audition with the Artistic Director, Jeffry Blake Johnson. This process enables us to develop a more accurate and varied assessment of the qualities and capabilities of each singer. Sing “America, the Beautiful” (in the key of B-flat for altos and basses, or E-flat for sopranos and tenors) or “Happy Birthday” (in the key of F for altos and basses, or B-flat for sopranos and tenors). Brief aural repetition (sing a melody back to the auditioner), sight-singing, and rhythm assessments. Professional training/experience is not required; however singers must be able to read music or sing back melodies with 80% accuracy. Dr. Johnson promises that the auditions will not be as terrifying as they may sound! Returning members of the choir will not need to perform a full audition. They will only be asked to take part in a Placement Hearing with the Artistic Director. Similar to typical vocal warm-ups, Dr. Johnson will lead returning members in a series of vocalises designed to give him an idea of the color and range of your voice. From the Placement Hearing, Dr. Johnson will be able to place the singers in the best section to fit the color of their voice. Placement Hearings will only take about 5-10 minutes. For soloists, by appointment, mid- to late-October or early November. For cabaret choir members, by appointment, early-January. By appointment, mid- to late-March. Auditions are scheduled directly with the Artistic Director via email at the beginning of each season. New members or returning members for the coming season may join up until the third week in September, the third week of January, or the second week in April. Ready to audition? Contact the Artistic Director at jbj@rccpittsburgh.com. Love our choir but can’t quite carry a tune? Join us as a volunteer! Join our "community that sings"!